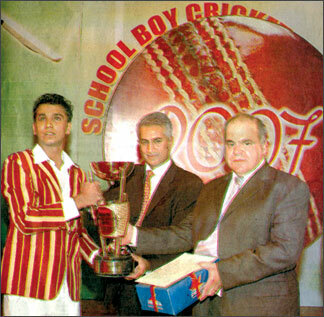 Malith Gunathileka receives Observer Schoolboy Cricketer of the Year award from chief guest Sidath Wettimuny last year. CRICKET: Ananda College captain Dushan Malith Gunathileka, the star allrounder, created somewhat of a record when he was picked Observer Schoolboy Cricketer of the Year 2007. But before getting that honour, the Observer readers picked him to be the Most Popular Schoolboy Cricketer of the Year All-Island 2007. This was the first occasion that a schoolboy got the two top awards in the Observer Schoolboy Cricketer of the Year competition. It was an unique happening that took place at the selections in 2007. The special panel of cricket umpires selected him for the prestigious award. Besides winning the coveted award he was also picked as the Best Allrounder and also figured prominently in the contests of the Best Bowler and Best Captain. Gunathileka became the sixth Anandian to win the coveted award. He followed World Cup winning captain Arjuna Ranatunga (twice) 1980 and 1982, Sanjeeva Ranatunga (1988). former Sri Lanka captain Marvan Atapattu (1990), Thilan Samaraweera (twice) 1994 and 1995, Muthumudalige Pushpakumara (1999). Malith blossomed out as a top allrounder. He was a right-hand bat and left-arm ‘leggie’. He was able to fit in at any position in batting and he was a clever and match-winning bowler too. He caused havoc among top cricketers in the schools. So with the promise that he held out as a schoolboy at Ananda College, it was no surprise that he would climb the ladder of success. With the success he gained in inter-school cricket, the umpires picked him as the Observer Schoolboy Cricketer of the Year in 2007. Born on 29th March 1987, Malith played cricket for Ananda from the age of 10 years in various age groups. His first coach was late Charles Warnakulasuriya and later he was coached by late P. W. Perera, P. Palitha, Anuruddha Polonovita, Vipula Sittamage and Udayananda Perera. He has captained under 14, under-16 and 1st XI teams with great success. His best performances for Ananda came in the year 2007. Malith had a good season, scoring 602 runs which included a century and four half centuries. His best innings was against Richmond where he got an unbeaten 100 and 50. His half centuries were against St. Joseph’s 74, Mahinda 76 not out and Wesley 51. Malith, as a left-arm ‘leggie’ captured 96 wickets during the 2007 cricket season. He set a record being the first Anandian to capture 90 wickets or more in a school cricket season. The other Anandians who came close were Anuruddha Polonowita, Palitha Premasiri, Ajith de Silva, Sonny Yatawara in wicket-taking. His best effort in bowling was a match haul of 13 for 58 against Royal. Due to Malith’s great bowling effort and able leadership, Ananda beat Royal after 47 years. The other best performance came against St. Benedict’s College (13 for 32). Malith had a match bag of 5 wickets on 13 occasions in the 2007 season. He was also a smart fielder in any position. Malith who was a fourth-year coloursman, turned out for Old Anandian SC in Division Three cricket tournament and also played in the under-20 Provincial Cricket Tournament with success. He was in the Sri Lanka Schools spin clinic managed by former Sri Lanka player Ruwan Kalpage. “It was sheer dedication and hard training that enabled me to reach a good standard in cricket”, said Malith Gunathileka. According to several former cricket stalwarts Malith was known as school’s new spin discovery and he had a big future for him. But once his playing days for school were over, he did not come into the big league as he was following a Civil Engineering Course to sit for the Degree in Quantity Server. Malith said that he has now been invited to play for Chilaw Marians in the Premier League Cricket Tournament in the coming cricket season. He is already attending practices. Malith Gunathileka, the gifted allrounder who has performed exceptionally well in the inter-school cricket matches, is determined to achieve success in the domestic tournaments. His ambition is to play for Sri Lanka in Tests and one-day internationals like the other Anandians. Malith’s brother Ushan Gunatileka is following his brother’s footsteps. Ushan is the Ananda College under-15 cricket captain. He also toured Malaysia with the Sri Lanka Schools Cricket Team for the Under-15 Cricket Tournament in Malaysia in 2007.